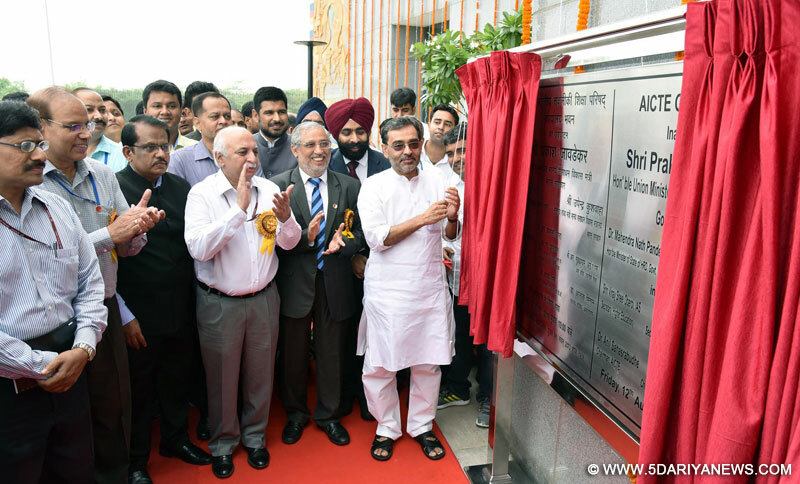 The Minister of State for Human Resource Development, Shri Upendra Kushwaha unveiling the plaque to inaugurate the newly constructed office complex of All India Council for Technical Education (AICTE), a statutory body of Govt. of India, Ministry of HRD, in New Delhi on August 12, 2016. The Secretary, Department of Higher Education, Shri V.S. Oberoi, the Secretary, Department of Defence R&D and Director General, DRDO, Dr. S. Christopher and other dignitaries are also seen. The Newly constructed office complex of All India Council for Technical Education (AICTE) was inaugurated today by Sh. Upendra Kushwaha, Union Minister of State (HRD). Speaking on the occasion, the Minister of State stressed the importance of AICTE in cultivating technology for the transformation of India, especially the rural India. He wished that the AICTE in its best capacity fulfill the vision of our Prime Minister for transforming India through facilitating quality technical education for our youth. Delivering the address, Sh. V.S Oberoi, Secretary (Higher Education) MHRD pointed out the role of close to 3 decades old AICTE in ensuring the access, equity and quality of technical education in India. Rather than just the regulating role, it increasingly acts as the catalyst in nurturing the technical educational environment of India, he added. Sh. R. Subrahmanyam, Additional Secretary (Technical Education) who spoke, also stressed the importance of investment in technical education for the economic development of the nation. Dr. S. Christopher, Secretary (R&D), Dept of Defence and DG, DRDO and Dr. G. Satheesh Reddy, Scientific Advisor to Minister of Defence also graced the occasion. Dr. Anil D Sahastrabudhe, Chairman, AICTE gave the welcome address. Earlier, the Union Minister of State had hoisted national flag after unveiling the AICTE plaque. AICTE which was functioning from temporary locations till now, will move to the new complex, an upscale office with modern architectural design constructed by DRDO. The Office Premise is spread over 5 acres with 37,500 sq.mt constructed area situated in Nelson Mandela Marg, Vasant Kunj, New Delhi. The office building is G+3 floors with three wings having total of a seating capacity of 300 employees and 17 conference rooms, an 800 capacity auditorium, a 20 room guest house and canteen for staff and officers. The built-up area is 19500 sqm and parking space of 18000 sqm making it a total built-up of 37500 sqm in the premises. The Council’s new home bears a strong resemblance to the transformation of the Statutory AICTE itself for over past three decades of its existence in the back drop of globalization of Higher Education particularly Technical Education. The number of technical Institutions in the country has increased manifolds since last two decades and expansion has thrown up a wide variety of challenges and addressing these challenges by maintaining quality and adoption of world class norms would constitute the key to ensure advances in the Human Development Index of the Country and transform the country into a knowledge society. The AICTE will now be better equipped with adequate infrastructure to deal with these challenges. The statutory All India Council for Technical Education was established on May 12, 1988 following the passing of AICTE bill in 1987. First full time chairman was appointed in 1993 and council re-constituted next year in accordance with the provisions of the Act. The AICTE, was moved out of the Ministry of HRD Govt. of India into Indira Gandhi Indoor Stadium complex at ITO New Delhi in 1994. Thereafter the office premises were shifted to Chanderlok Building Janpath New Delhi and partly to NBCC Building at Lodhi Road New Delhi and partly at Mayur Bhavan Income Tax Building Shankar Market Connaught Circle New Delhi. Now onwards, AICTE will work from the new Headquarters with increased efficiency to transform the technical educational sector of India.